The price is against it, but this is a characterful, warm snare with a genuinely unique sound and style. Fantastic, thick, warm tones. Great looks. For a price Truth will build drums using myriad materials and finishes to realise your wildest imaginings. Here we take a look at truly unusual maple, walnut and acrylic snare. Truth is an American custom shop, based in Oregon. We recently reviewed a relatively standard Truth kit, and now we have a unique snare drum which shows another side of the company - Truth's ability to dream up weird and wonderful one-offs. This 14"x6" drum has a hybrid shell made from a combination of three rings of maple/walnut enclosing two rings of half-inch thick clear acrylic. The wood is roughly the same thickness as the acrylic, being made from eight plies of maple on the outside with seven plies of walnut on the inside. The plies are butted-up, as are the two acrylic rings which have single, neatly welded joins and are slot-routed into the wood. This is a weighty shell and adding to it are the full length twin-mount tube lugs and die-cast hoops. The other unusual aspect of this drum is that there are 10 air vents, equally spaced and set in the acrylic behind each of the 10 tube lugs. To get the best out of the hybrid shell, Truth has fitted a Trick GS-007 throw-off in brushed aluminium and 42-strand steel coil snare wires. "We really fell for this snare. The mixture of acrylic and wood produces a thickly warm and musically dusky timbre"
We really fell for this snare. The mixture of acrylic and wood produces a thickly warm and musically dusky timbre, while the 10 air vents restore the punch and zip. This drum was fitted with a white coated batter with centre dot and underneath perimeter flap contributing to the crisp tone. The layered construction means the shell is broken up of course, and added to this the die-cast hoops and damped batter head all lead to a disciplined, fat sound again. Making it even fatter, wetter and snarier is the 42-strand Taiwanese steel wire snares. 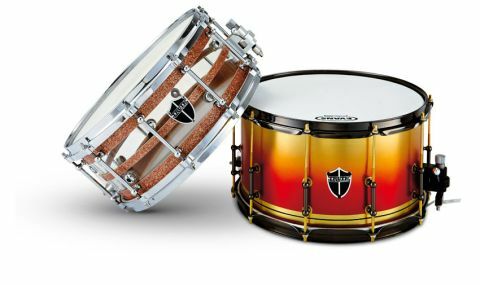 These snares can be misleading in that any drum saddled with them immediately sounds crunchier and sizzlier. And tighter due to the inevitable extra damping effect of such a wide snare pressing on the bottom head. In fact, we tried swapping the 42 strander onto a brass shell snare for comparison and yes, we got an immediately plumper but crunchier sound again. In fact the 42-strand snare can overshadow the fundamental drum sound if you're not careful. However, this drum has enough strength of character to shine through.